Enzyme assays of β-N-acetylhexosaminidase from Aspergillus oryzae using capillary electrophoresis in the offline and online setup have been developed. The pH value and concentration of the borate-based background electrolyte were optimized in order to achieve baseline separation of N,N′,N″-triacetylchitotriose, N,N′-diacetylchitobiose, and N-acetyl-d-glucosamine. The optimized method using 25 mM tetraborate buffer, pH 10.0, was evaluated in terms of repeatability, limits of detection, quantification, and linearity. The method was successfully applied to the offline enzyme assay of β-N-acetylhexosaminidase, which was demonstrated by monitoring the hydrolysis of N,N′,N″-triacetylchitotriose. The presented method was also utilized to study the pH dependence of enzyme activity. 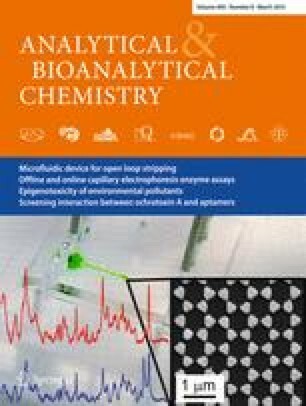 An online assay with N,N′-diacetylchitobiose as a substrate was developed using the Transverse Diffusion of Laminar Flow Profiles model to optimize the injection sequence and in-capillary mixing of substrate and enzyme plugs. The experimental results were in good agreement with predictions of the model. The online assay was successfully used to observe the inhibition effect of N,N′-dimethylformamide on the activity of β-N-acetylhexosaminidase with nanoliter volumes of reagents used per run and a high degree of automation. After adjustment of background electrolyte pH, an online assay with N,N′,N″-triacetylchitotriose as a substrate was also performed. This work was financially supported by Charles University in Prague, projects GAUK 710, SVV and UNCE, by the Ministry of Education, Youth and Sports of the Czech Republic, project MSM0021620857, by the Czech Science Foundation, project P206/12/G151. The authors would like to thank Dr. Václav Kašička and Dr. Dušan Koval (Institute of Organic Chemistry and Biochemistry, Academy of Sciences of the Czech Republic) for graciously providing the CE–LIF instrument as well as valuable consultations and advice, and Zdeněk Kukačka for isolation of β-hexosaminidase from Aspergillus oryzae.